Meet Bob Page of Replacements, Ltd. I cannot tell you how happy I was the day I found Replacements, Ltd. For people like me who love beautiful china, this is a fabulous resource company. Replacements is a valuable resource if you are trying to find retired or antique china patterns. But I especially love the fact that they can identify a pattern for you if you have no idea about the identity. Our stylists here love working with Replacements when they are planning photo shoots and need a specific color or style of teapot or an incredible china pattern that is no longer made. 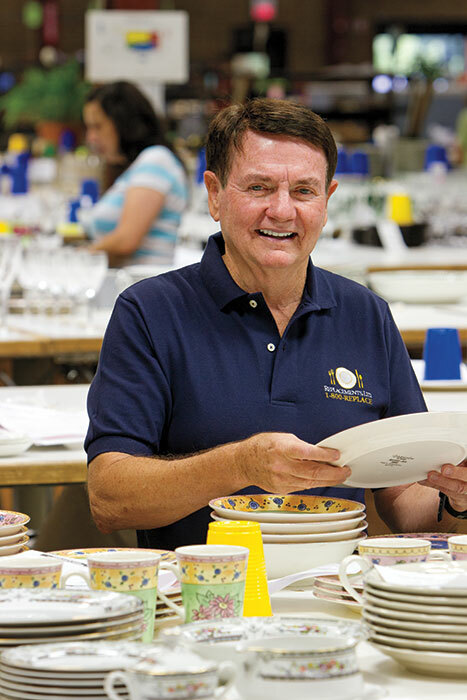 Bob Page has been easing the heartbreak of shattered teacups and misplaced sugar tongs for more than three decades. 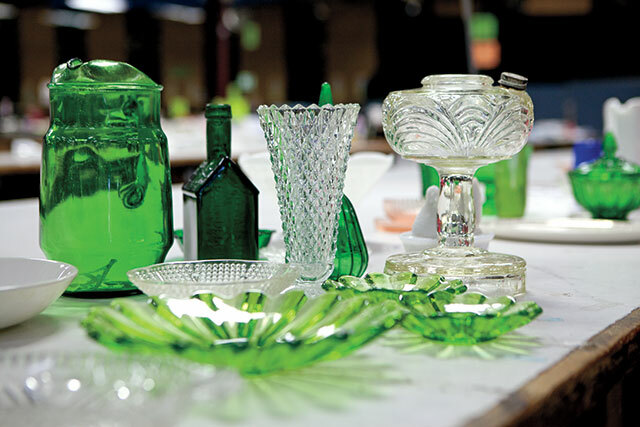 The founder of Replacements, Ltd., houses an impressive 12 million-piece inventory of 400,000-plus patterns within 500,000 square feet of space. 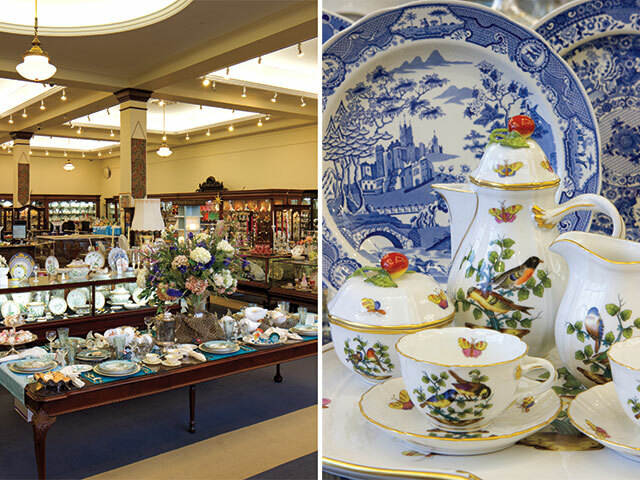 From ornate 19th-century silver tea services, to unpretentious blue-and-white transferware classics, and everything in between, there is no better or more reliable source for heritage china, crystal, and silver than the Greensboro, North Carolina–based company. In 1981, Bob quit his job and officially launched Replacements, Ltd., with just one part-time assistant. Thirty-four years later, he oversees a staff of almost 400 employees. “I never envisioned this would grow like it has or that there would be the demand like we’ve experienced for some of these old patterns,” he says. Read the rest of the story in the January/February issue of TeaTime. I’d love to hear any stories you have about replacing favorite teacups, china, crystal or silver. Please share in the comments. Pure excellence! I can’t rave enough about this company and the fine china, crystal, memories and family heirlooms preserved and sold here. Makes me wish I had more cabinet space. Everything I have purchased for myself or gifted to others has been perfectly beautiful. The terrific packaging is even fought over when a box arrives and the contents removed, to reuse boxes & packing materials, it is so well done. I can spend hours looking at the website, going down memory lane seeing older patterns and ordering a few more pieces to fully complete a set I have at home or a family member has had passed on to them. All the customer service at Replacements is wonderful. A comment almost never stated these days in a ever harsher, rude world. Thank you so much for doing what you love, with love & care! We customers love it too. After finding the coffee pot and demi tasse in a flea market, my hunt began for any other pieces, of Spode circa 1926…In 1981, I finished it thru Replacements and have loved every piece…..
Love this place – customer service is exceptional!!!!!! I love Replacements! I had chipped 2 of my grandmother’s Noritake dinner plates during a move. Looked through the online patterns which in Noritake is endless (Grandma never told me the pattern number). Found close patterns but not quite. When we vacationed in the OBX, I brought one of the plates and made my family stop at the store. They scanned it in and gave me the pattern number. They didn’t have the dinnerplates but I registered the pattern so that when they got some in I would be notified. Well three years later, I received an email that they had just acquired 8 dinnerplates! I ordered and received the 2 dinnerplates I needed. I also ordered another 4 plate setting of my mother’s Syracuse china as she only had 8 place settings and took advantage of free shipping offer. Their customer service should be a model for companies everywhere. Also, highly recommend stopping in their showroom. Even my family was awestruck! Probably a good thing I live in Indiana as it would be dangerous if I lived closer. I, too, have enjoyed using Replacements, LTD. Back when we married in 1964, I received 8 place settings of my china. Today we do entertain a lot and never do we have 8. We generally will do at least 2 tables. Checked with Replacements…..yep, there was my china and I very easily purchased 8 more place settings. Love it! I have been using Replacements, Ltd. for years to complete my china pattern that I inherited from my mother and also to complete my silver service. Everyone there is so patient and helpful in searching for whatever you are looking for. Visiting the store is like visiting a museum. There are so many wonderful things to look at. Replacements, Ltd. really is a treasure. Do you know the name of the china in the photo on the right? It is next to the Blue Willow. Melissa, I assume it us the photo of the rows of plates? Give me a row and plate number.I can’t find blue willow. I think she means the one at the top of the page. Not the one with the row of plates. It’s a pretty pattern with birds and there are several pieces on display in the picture. The pattern is Antique Rothschild Bird by Herend China. Pictured is the 6 pieces mocha set that is actually available for sell, in stock, on their website. Fabulous company that I am very familiar with for over 30 years . Replacements helped me complete my “1970 ish” Noritake pattern of “Moonbeam”. I love the china pattern as much today as I did then. I have ordered crystal and silver pieces as well . Service and delivery always wonderful . A couple of years ago on a return trip from the South , we took the time for a most pleasant detour – and visited Replacements ! I purchased china for my Fall/Thanksgiving table . I hope to return someday – until then, I will continue to navigate the website and open their mailings that are delivered to my home several times yearly. A girl can never have too much china ! My guilty pleasure . Thank you for another lovely post ! I’ve been a customer of theirs for years and years. I had the opportunity to visit the actual store a few years ago and it was definitely the “kid in the candy store” feeling. I love, love china, crystal and silver. This store is the best! Love Replacements! A go to for broken china or just china you like to buy. I believe they also let their employees bring their dogs to work. As a Registered Nurse for many years, I have often been on the receiving end of “inspections”. I can understand how Bob felt. This feels like WAY more fun! I have kept a cut out add for Replacements (and now can go online) to go to if I ever need pieces for my (discontinued) china pattern. I am so grateful they are there. I have a friend that has used your services for selling her china. I had looked up my Rosenthal china on your website for prices. But I was more astounded when I happened to look up Tea Leaf, which I have collected for 50 years. There it was! I am thinking about down-sizing and will keep you in mind.What a great service you have. Replacements LTD is a gold mine! I love, love, love Replacements, Ltd. They are a relatively short drive from where I live in the RTP area of North Carolina. I feel like a kid in a candy store when I visit this huge store. It is truly an amazing business. I collect Royal Crown Derby in the Blue Mikado pattern and Replacements, Ltd is my go-to resource. If you travel through North Carolina for business or pleasure, this shop is a must-see! Keep up the great work on your magazines which I anxiously await each month. Best wishes for a great New Year! I have sold to replacements. Keep in mind if you wish to down size your dish collection. They are very fair. The customer service is very good. I have been a customer of theirs for years. In fact I received a fill in plate from them for Christmas and am waiting on the delivery of another any day now. If you ever have a chance to visit in person, I can say that it is a woooonderful place!! Wish I still ived in Raleigh so I could drive up there for a look around today. I was there just before Christmas. I had given my son & his wife my set of Fostoria crystal glasses that he had long admired. A we carefully packed the crystal for him to bring home, he expressed a wish that there was one more champagne glass. I found it @ Replacements, Ltd. & gave it to him for Christmas along with a list of the other pieces in that pattern. He was thrilled. When I first married in 1971, I received a starter set of beautiful everyday china. Very beautiful and feminine, but not delicate like fine china. There were enough pieces for my husband and me, so I never completed the set. By the time our family grew and I decided to buy more pieces, the china had been discontinued. To my delight, my sweet husband surprised me one year for Christmas with a huge box full of the rest of my dishes, along with serving pieces and extras like a teapot, etc. Love it. It was like receiving an inheritance from a loved one or something! Since then, I have ordered additional pieces of my everyday silverware which had also been discontinued. Very pleased, and so happy Replacements is there for us! I love this company. I still need some pieces. So I will continue to use them. I have used this company numerous times. I believe I first became aware of it almost thirty years ago when I needed more of my china and saw an ad in a magazine, most likely the original Victoria magazine. Just a week or so ago they came to my rescue once again when I needed to replace a favorite platter that broke. So thankful for them! I would love to have something like Replacements Ltd.close to home…it takes a very special person to do this type of work…Bob Page is the keeper of treasures! I too have used this company. They helped me with China from my husband great grandmother, pattern name, year it was mfg. etc. I haven’t been there for many years, I will return. Love Replacements LTD. So glad he started it, only way I can find most of the things I have if something should get broken. I have adored this wonderful company for over 30 years. 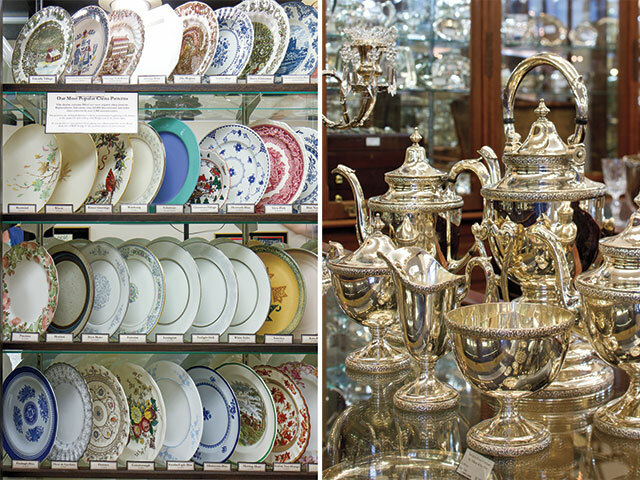 They are a treasure for those of us who collect beautiful china, crystal, and silver. On our trips to the Hickory, NC, market, it was always a delightful highlight stopping at Replacements in Greensboro. I always felt we were at the Disneyworld for antique china lovers!!! With their help I have filled many holes in my own collections and for a while became a dealer who actually sold to them. Their knowledge, inventory, and customer service can’t be duplicated. 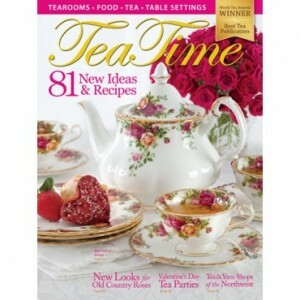 I look forward to reading your article in TeaTime. Our daughter married, had children thus our family grew More stainless steel flatware was needed and Replacements, Ltd. found it for us quickly. This is so fascinating!! I love what they do….and they have helped me more than once! Such a unique and highly sought after service. I am always so inspired to see and read about people following their dreams and with 400 employees think its safe to say his idea was a fabulous one!